Baltimore Police tell WMAR-2 News that an off-duty officer was struck Monday morning as she tried to help a driver with a disabled vehicle. BALTIMORE — An off-duty Baltimore Police officer was struck Monday morning, leading to a massive back-up on the highly-trafficked commuter route as the highway was shut down by first responders. 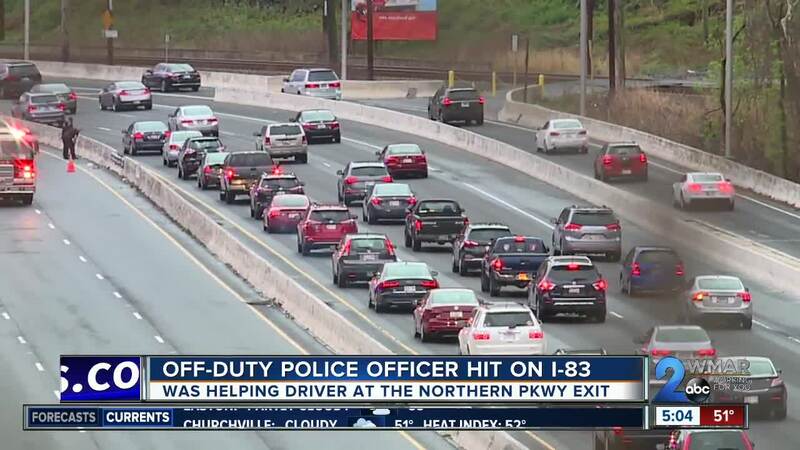 Baltimore Police said the officer had stopped to help someone who had been in a previous accident on northbound I-83 at the Northern Parkway exit. Police did not say if the officer was inside or outside of her vehicle at the time of the accident. The officer was taken to Maryland Shock Trauma for treatment of "non-life threatening injuries," police said. The officer injured her knee, but was considered in "fair condition," police said. Northbound I-83 was closed at the accident scene through the morning rush hour, causing significant delays in the area.